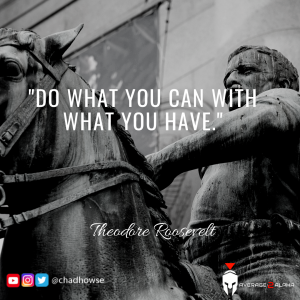 Quotes a man can live by… Do they actually make a difference? I’d say 100% yes. When we have something memorable in our minds in tough times we’re able to use such sage advice to make the correct decision. That’s what life’s all about, making the right decision, not the easiest one, but the right one. We do that over our lifetime and we win. These quotes that follow are quotes every man can live by, use them often. We forget this far too often, that nothing good can come from a soft, easy life, and that everything worthy of who you are comes on the back of effort. Yet, we despise effort and struggle even though they’re the only path to what we genuinely want in life. For the few who recognize this and accept it, life will be good. You’ll adopt more pain and difficulty, and thus, you’ll become tougher and more worthy of a successful life. You’ll leave the weak, the soft, the envious and jealous behind and you’ll develop a great life for yourself and those whom you lead. Effort isn’t the enemy, ease is. 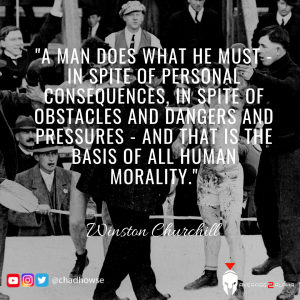 This is true for the society and for the individual, if you are first soft and do not have the underlying barbarian virtues, the soft, the ‘good’, the caring virtues are to no avail. 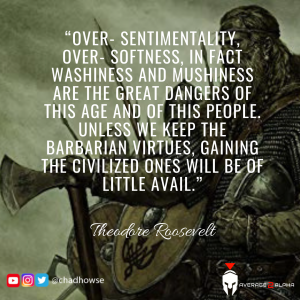 The barbarian virtues protect the softer ones, they enable them to exist. But one must first become dangerous and barbaric before he can become soft and courteous, at least for men. Today we forget that fact and ignore it. We train our boys to be soft, weak, and meek in school systems that are built for females. Men need battle, as do boys. We need combat, we need to practice grit and toughness. We need struggle, pain, and we need to be dangerous, not just for our own sake, but for those around us who we lead, protect, and defend. Simply put, don’t adopt a soft life. Don’t teach your boys that being kind and soft is better than being dangerous, they’re both required. A SOFT MAN IS A USELESS MAN! Most exist, few live. Living, in its truest sense, demands more than existing. It requires struggle, something to fight for, to fight against, and to defeat. Often that battle is internal, sometimes it’s external, but there is always attrition in a life well lived. Life is not peaceful. It is not easy. It’s a struggle. The more you accept that there is a struggle, and the greater the struggle you take on to conquer, the better your life will be. ‘Tis better to fight for something than live for nothing. What are you doing? What battle are you engaged in? What enemy are your aiming to defeat? What soul are you trying to take? What legacy are you working on building? No great thing is won by chance, no grand life is created accidentally. Fight for something, and live, or go through the motions and exist, waiting for a deathbed with regret as your only bedmate. Men, be suspicious of any government, be they right, left, or center, but especially the left. You cannot gain more power as a modern government without adopting socialist and communist policies. Both literally hand more power to a government who is not at all accountable for the decisions they make. 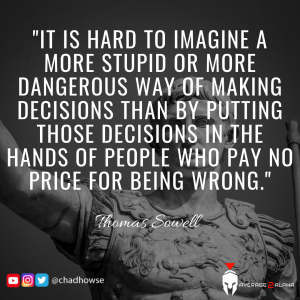 Men choose freedom, we choose liberty, we want to bare the brunt of the consequences for our own actions, we do not want to have to play the dangerous game of finding out if a government will make the right decision over time. We do not want higher taxes. Men don’t want strict gun laws because all they do is infringe on the legal gun owner and do nothing to dissuade the criminal, much like an unarmed man does little to dissuade a criminal whereas an armed man does in spades. We do not want our property rights infringed upon. Our land is our land, it gives us a stake in our country, pride in where we live and how we care for our home. The more a government grows the less freedom there can be. se that obsolute power will eventually be used by people who simply want to control. People are afraid of responsibility, especially today. We’d rather have someone else make decisions for us, like where to put our money, how to use it, what laws we abide by, and how we protect our homes. Men, however, want more responsibility. we want to be judged for our actions, we don’t want someone else to be responsible for anything in our lives. We need responsibility, we crave it, because responsibility is freedom. And men NEED FREEDOM. Any relinquishing of said freedom is moving closer to slavery, where you do not have power over your own life, your own home, your own money, anything. 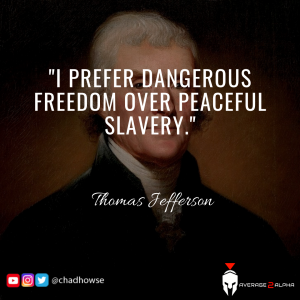 Freedom can be difficult, it puts more on the shoulders of the individual, but as history has repeatedly shown, the removal of freedom has always led to a desperate and poor mass with power being held by a select few in government. We need men to make sure that doesn’t happen. We need men to stand up, to lead, to topple structures that remove freedom. The only way you do that, as a man, IS TO BECOME SELF-RELIANT. Don’t depend on others, or the state, or anything. Do all you can to be independent. To be independent is to be dangerous in the most glorious way possible. It’s a simple call-to-action, but one that most don’t heed. We want what we don’t have, and we don’t focus on doing what we can with what we have, and we lose in the end. 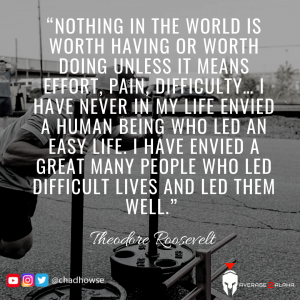 Most become envious and bitter that they don’t have what they want, but the reality is that they didn’t accept where they were and do the best they could with what they had. They whined and wished that things were different instead of making them different. Every man should take this quote to heart and don’t try to do anything other than this thing. If you do the BEST you can with what you have and where you are, you’ll live a good life. Men are bearers of responsibility. Men make the tough decisions that no one else wants to make. They go against the tide, against what’s popular, in order to do what’s good, what’s right, and what’s best. That’s what being a man is, doing what others don’t want to do, and taking pride in doing it. Making tough decisions, working harder when you’d rather rest, protecting and putting yourself on the line when you’d rather flee to safety.